Let's say, hypothetically, that you're the type of person that really likes to keep adding accessories on your bike. Heck, that's why you keep coming back to look at reviews about accessories that you might be somewhat interested in right? What if you ran out of items to install on your rig, but still needed your accessory fix? That's when you start accessorising your accessories. Think of it as bedazzling your stuff, but not in a dumb or cheap way. The best way to go about this kind of self medication is to add a bit of chrome to something un-chromed, like something that's plain ol' black leather. 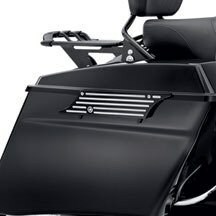 We'll start by adding some chrome to your plain-Jane saddle bags with the Harley-Davidson Edge Cut Collection Saddlebag Latch Kit. These guys are made out of a rich black anodized aluminum that is machined to expose its rich highlights. These covers replace the original latch covers, but retain the stock hinges and locks to make installation easy. This kit includes enough goodies to do both the left and right sides. These will work on all 1993 and later models equipped with factory bags. Harley-Davidson may one day add an accessory on to this accessory for an accessory, so keep your eyes out.